Everybody recognizes the unique convention aesthetics of the pipe and drape. Vertical telescopic pipes supported by a steel base provide a frame for detachable drape panels. This is the perfect setup to provide an open yet customizable area for trade shows and convention exhibitors. The piping is flexible in that the telescoping pipes can adjust to varying lengths, and the drapes can come in any number of colors, allowing your event to be carefully themed. If you are planning an expo, convention, trade show or other event, Southeastern Convention Services is your number one resource in Atlanta and the Southeast for pipes and drapes. Not only will we supply them for your event, but we also offer setup. 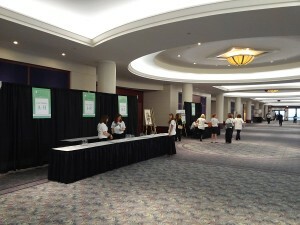 We’ll work with you or event organizers to map out the size of the exhibitor stations so that we can carefully adjust the pipe and drape setup to accommodate your expected turnout. With our pipe and drape services and our assistance, together we’ll make your event a huge success. At Southeastern Convention Services we only use the best equipment. Our piping and drapes are both from high quality manufacturers and are made of the finest materials. We also keep a full stock of color options in our drapes so that we can fit any theme you have in mind. Our designers are extremely competent and can help you decide on theme colors as well, and our technicians are fast and efficient. We’ll help you design the perfect event and set up your pipes and drapes in no time. Pipe and drape setup is not just exclusive to expo halls either. You would be amazed at the elegant look the right color drapes can add to an area; perfect for a wedding or benefit. Our rental fees are very reasonable and labor rates are affordable. The layout of the floor is intimately tied to your pipe and drape setup, as it will dictate where everything will be located. Aside from assisting in theme design, we also have years of experience working trade shows and other events and can help you maximize your space with a well thought out floor plan. When we are done your expo floor plan and pipe and drape setup will be primed for efficient floor space and exhibition success. Your floor plan and layout essentially dictates the flow of your entire convention. Take advantage of our experience and we’ll assist you in making sure you have clear space and visibility while also providing room for speakers and exhibitors to deliver their message. These are the elements of a successful event. Carpet is not necessary for every event, but it does leave a good impression. Many conventions offer hours of great information accompanied by hours of walking. Carpeting your event will not only give you another stunning aesthetic design element that will match your theme but also make guests and exhibitors (or speakers) more comfortable. This can go a long way in building your reputation in the convention or trade show industry. Every event, be it trade show, convention or even a wedding, needs furniture and other elements. Your speakers or exhibitors will need a platform for a display, your visitors will need a place to sit; any event requires furniture. At Southeastern Convention Services our mission is to take all of the worry and work out of putting on an event. We aim to literally be your one stop shop for all of your event design needs. From top to bottom, we provide your event with every detail it requires. An event decorated by Southeastern Convention Services will look great, be comfortable and leave a lasting impression. At Southeastern Convention Services we offer custom aisle markers that will help control the flow of traffic at your trade show. As people traverse your convention floor, it is important that they are able to easily identify the exhibitors and their location. With custom aisle markers, you can keep the theme of your event intact while also providing this valuable service. We also offer booth signage at extremely affordable rates. We have access to talented graphic designers and printers who can make you or your exhibitors the finest booth or aisle signage, allowing for your event to really convey high class. If you want to keep a neat, orderly flow to the traffic and information on display at your event, let Southeastern Convention Services handle your trade show displays. Custom aisle markers, aisle signs and booth signs that all fit within your theme will show your attendees the extreme level of professionalism they are dealing with. If you are looking for an Atlanta area pipe & drape contractor, please call 1-888-608-EXPO or complete our online request form.